The year end is just around the corner. Two recently released heart-wrenching movies are being recommended for the season. The two movies share one thing in common, that both are documentaries based on the daily lives of real people. The first is "My Love, Don't Cross That River," a story revolving around an old couple that has been together for as long as 76 years. The other is "The Hospice (목숨)." It deals with patients in a hospice preparing for their final moments in life. It's long been believed in both the box office and among movie-goers that documentaries can rarely succeed. These two films, however, have broken those perceptions and are on a steady rise. "My Love, Don't Cross That River" tells the story of an old couple who have loved each other for their whole lives. 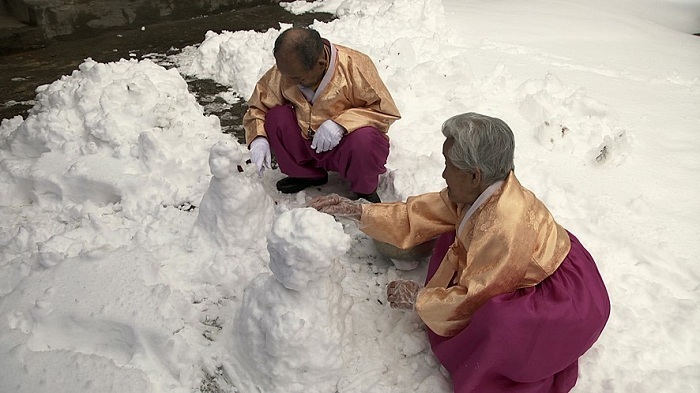 The protagonists are husband Jo Byung-man, 98, and wife Kang Kye-yeol, 89. 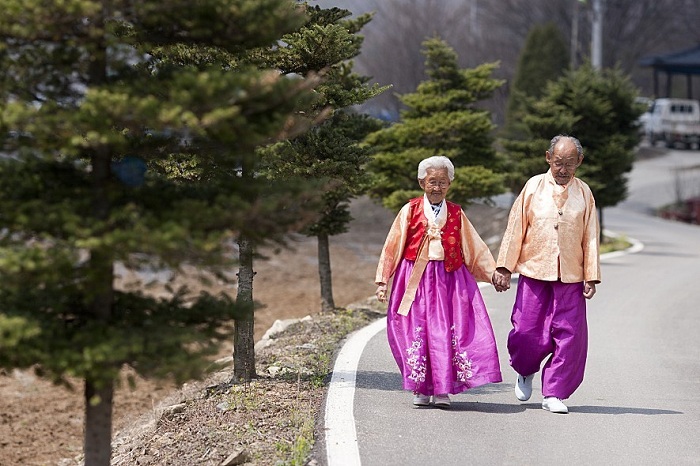 Wherever they go, the couple wears Hanbok in matching colors and walks with hands tightly clasped. 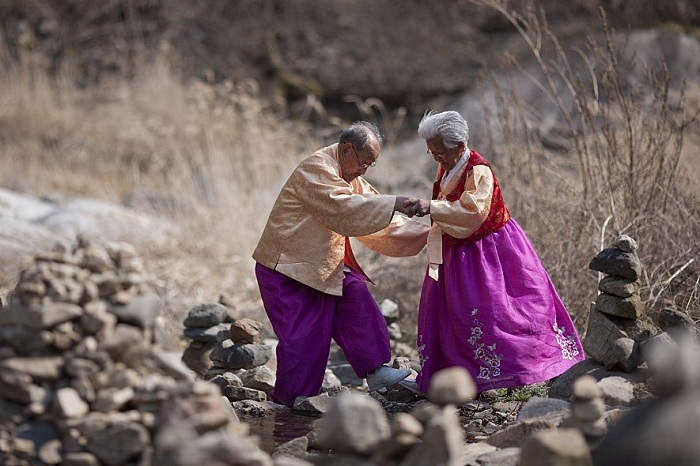 "My Love, Don't Cross That River" shows the romantic daily lives of an old couple. In the spring, the couple picks beautiful flowers together and pins them in each other's hair. They play with the water in the streams in the summer and in the fall, enjoy the autumn foliage together, even throwing leaves at each other. In the winter, they make snowmen together. With the passage of time and age, Jo becomes increasingly weak and separation draws near. "I really wish I could go with you," the wife cries in the movie, bringing tears to viewers' eyes. 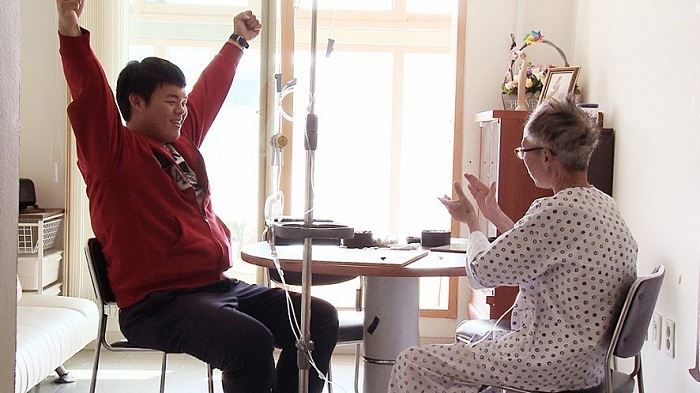 "The Hospice" shows the lives of patients and their families at a hospice. It's sad, yet heart-warming. "The Hospice" tells the story of patients at a hospice who, on average, have 21 days left to live. They are all a special someone to their fathers, mothers, spouses or children. The movie pictures the final moments of the patients in their deathbeds, a time that nobody can avoid, moving the hearts of viewers. The message that the two movies both pursue is the true meaning of life. It reminds us of things that we have forgotten, but which were never meant to be. 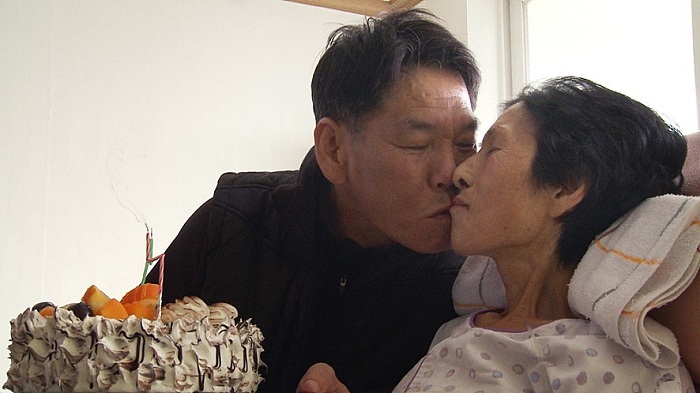 Director Jin Mo-yeong of "My Love, Don't Cross That River" said, "It seems that people of all ages and sexes have sympathy for the love story of the old couple. 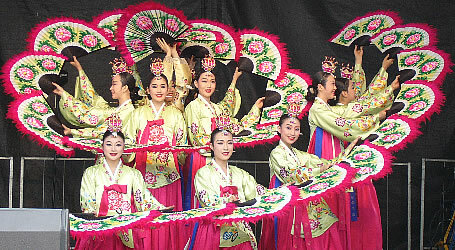 They've recommended the movie to their parents and family, drawing even bigger audiences." Director Lee Chang-jae of "The Hospice" said, "Thinking about death and having only 21 days left to live is both sad and scary. However, the movie shows happiness and love as much as it scares you. This movie will give you the time to turn your eyes to things that you have missed out on for some time, such as the preciousness of yourself, your family and your acquaintances." Both movies bring you to the intersection of life and death, encouraging you to think about "how to live." Major theaters across the country will be screening both documentaries.